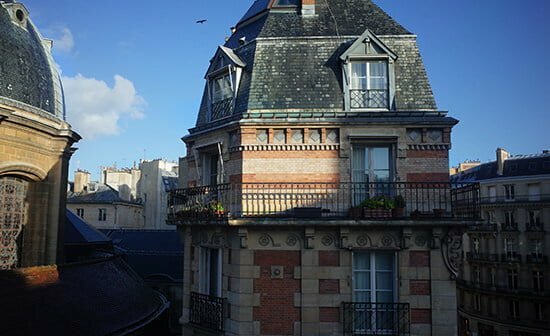 After a snowy week in England, we woke to blue skies, warm croissants and this amazing rooftop view from our hotel room. I couldn’t resist a quick pen sketch of the row of chimney pots in the distance before we hit the show, check out those windows! 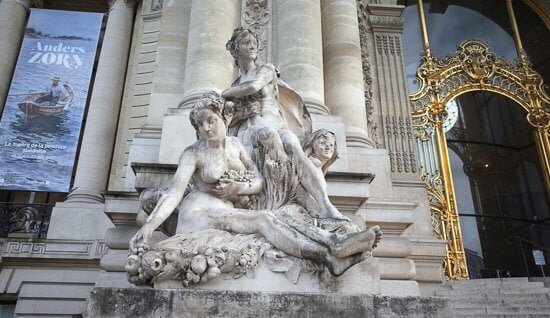 The entrance to the Petit Palais is a fabulous staircase topped with gold wrought iron doorways and elegant sculptures. Ornate domed ceilings and decorative murals give the museum a real feeling of grandeur with huge light filled spaces. In his lifetime Zorn was a very successful and sort after portrait painter. His brushwork is akin to Sargent’s quick handling and he is known to have been a keen advocate of drawing with the paintbrush much like Sargent’s tutor Carolus-Duran and his limited palette is often reveared for creating naturalistic skin tones. He spent his childhood surrounded by nature in the rural landscape of Mora, central Sweden and with a natural talent for drawing and sculpture, at 15, he was sent to the Royal Academy of Arts in Stockholm. Clashing with the director he left to study abroad in Spain, by way of Paris and London. By 1882, Zorn had moved to London’s fashionable Mayfair and quickly developed a reputation as an excellent portraitist gaining many commissions. In 1885 he returned to Sweden to marry Emma Lamm who is depicted in the portrait above, a wealthy young woman from Stockholm’s upper-class society to whom he had secretly become engaged in 1881, introducing Zorn to a new social circle and clientele. I was particularly interested to see this portrait ‘in the flesh’ as I’d studied it at length so it was fantastic to experience the painting alongside other works created in the same time period. Zorn was also recognised as an exceptional watercolourist. In the watercolour above, which at first glance seems to be an oil painting, his wife Emma waits on a dock for the approaching boat, although familiar with this piece I hadn’t ever realised Emma was the model. Often artists use the texture and tone of the watercolour paper as an integral part of the piece but here by using opaque applications, Zorn has left no trace of the white paper below. They travelled extensively and captured their journey through his paintings of the harbours. 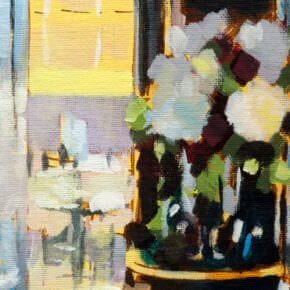 The exhibition gave a real sense of their relationship and painting adventures from West Constantinople, Algiers, St Ives in Cornwall, Hamburg, Venice and Stockholm Archipelago. In 1888 Zorn moved to Paris to paint a series of portraits of the banker Ernest May and his children. 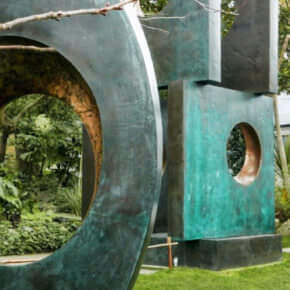 This proved to be a key encounter as through him, he met prominent figures in politics and art including Antonin Proust, Armand Dayot and the dancer Rosita Mauri all future clients and friends. His initial studio was on Rue Daubigny but moved to a more permanent location on the Boulevard de Clichy, in Montmartre, just down the road from the Moulin Rouge. He was a sensation at the Salon of 1891 with no less than 12 works accepted, at the next year’s Salon he presented a painting entitled ‘Omnibus’ that earned him the reputation of a ‘revolutionary’ and in 1893 was compelled to withdraw his ‘Venus de la Villette’ which was considered too shocking for the show! 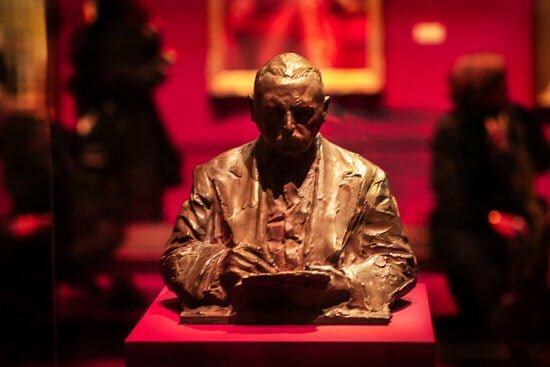 In 1895 Zorn participated with his friends Rodin, Whistler, Besnard and Thaulow in the first ever Maison de L’Art Nouveau at the Bing Gallery. 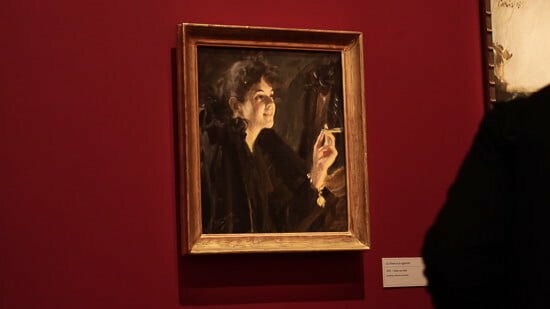 In under a decade, Zorn had become a highly prominent figure in the Parisian art scene which he would always remain in contact. What is often key to Zorn’s full figure pieces if his use of the sitter’s hands to reveal their character and in this painting of Emma in their Paris Studio, notice how the position of the hands also draw our gaze to the arrangement of sketches and painting in the foreground. It’s here that you can see Zorn’s rapid brushstrokes, from the diluted underpainting on the left to the solid block of green on the right. The hand is delicately painted on top of a dark square which helps to bring out the contrast and draw our focus. 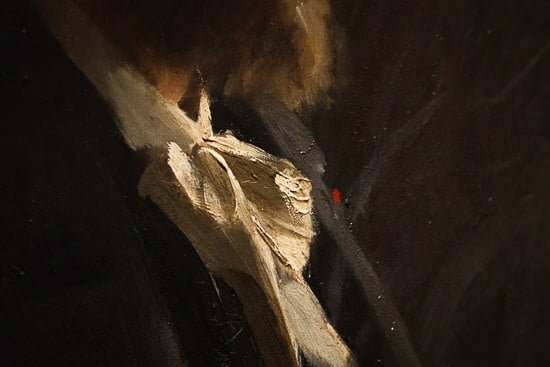 If you look back again at the whole painting, notice how your eyes first focus on the face then get drawn down the right arm, due to the diagonal angle, then move across to the left hand by Zorn’s use of high contrast and then back up to the face – completing the triangle. 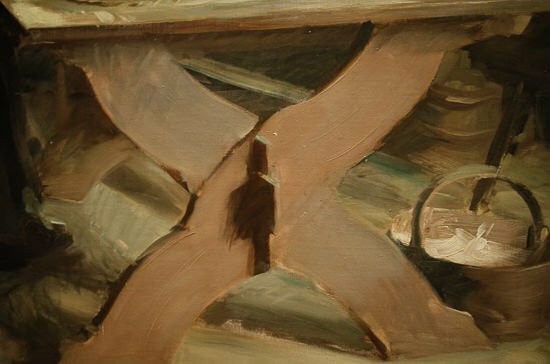 Interestingly, Zorn used a range of thick and thin applications in his oil work to reveal the canvas ground beneath, compared to the full opaqueness and more even-handling shown in his watercolours. Imagine if this portrait was cropped without the cigarette, you’d lose that sense of atmosphere and nonchalance of the sitter. Rather than working in his studio, he prefered to paint his sitters in their homes to better capture their character, with decor and accessories playing an important role. 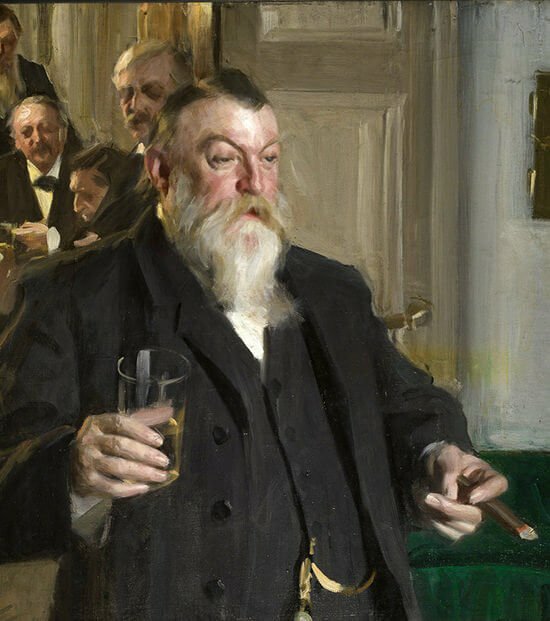 And we can see here in a Toast at the Idun Society, he’s captured the exuberance of his model by placing a whiskey in one hand and a cigar in the other, they both act as props to the scene. 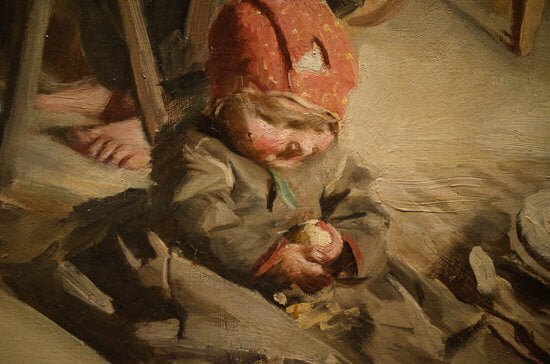 Zorn also used hands as key elements to balance his colour compositions. Throughout the show, there were many examples of his use of the red and green and the cigar in the corner is a perfect example. You can see the same method used in this portrait, with the stronger red being introduced with the ruby ring. Another method often used to create a focus within portraits is to add thicker impasto paint to the surface. If you add thicker paint next to the face, it can bring a three-dimensional quality to the work. 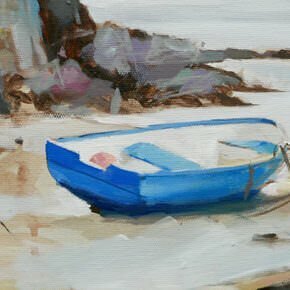 You can see the thicker marks of the brightest whites bring the bow forward in the painting, there’s even a little dash of red just to help add a pop of colour to focus our eye. Pro tip: If you every study Constable’s paintings, you’ll see his use of small dashes of red within a green landscape which became a trademark of his scenes. A large number of Zorn’s portraits were produced in the United States during the seven trips he undertook there, bankers, tycoons and politicians including three US presidents all sat for Zorn. 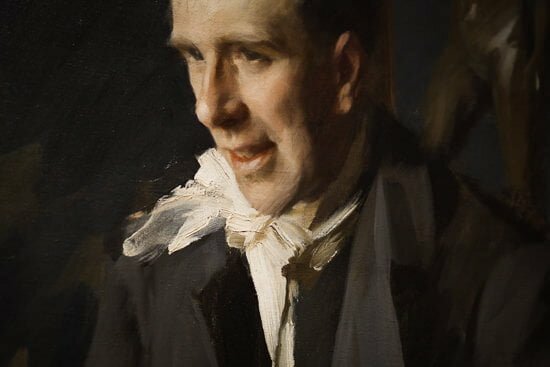 I love the movement Zorn’s created in this portrait of Coquelin Cadet a famous actor of the era, by the fast paint application of his collar. Whilst in London in 1882, Zorn met Axel Herman Haig also Swedish who introduced him to printmaking. 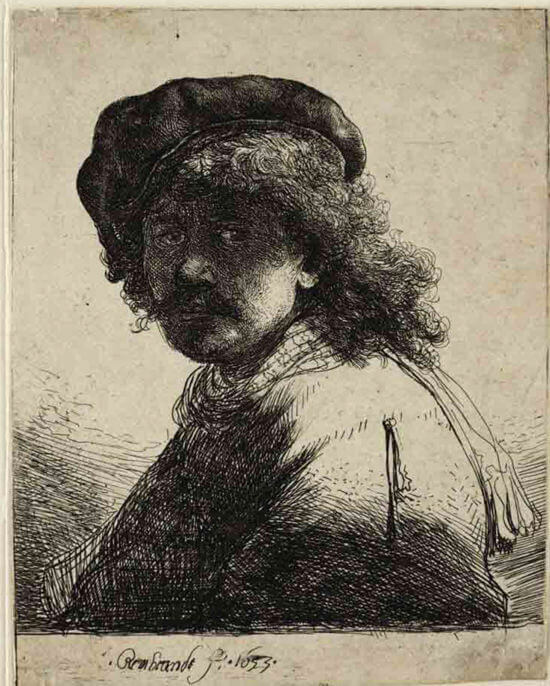 Zorn was a fast confident engraver and was heavily influenced by Rembrandt, whose prints he collected. He shares his style of sketching, contrast of shadow and light and often depicted himself. Studying Zorn’s etchings, give you a real insight into how he might have thought and approached his painting brushstrokes. In the etching above, the changing of the marks help to define different surfaces. 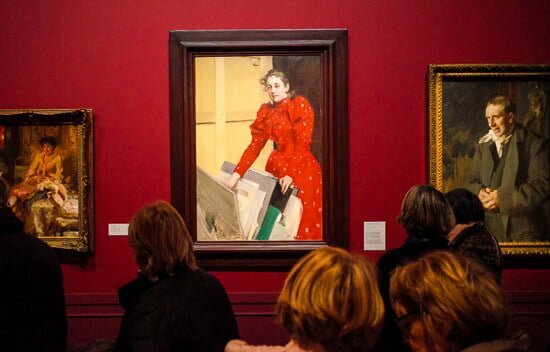 The diagonal cuts on the foreground jacket sleeve add movement and direct us towards the man’s face, we then follow his gaze to the seated female figure in the background, the marks behind her are all vertical, which in turn calms the eye. It was also interesting to see how an initial black and white sketch was then developed and interpreted into a painting. In the Waltz above, there’s this really lovely sweep through the composition that sends our eyes past the figures in the foreground and through to the bright white area behind the curtain, it feels like this dance is more private, away from centre stage. 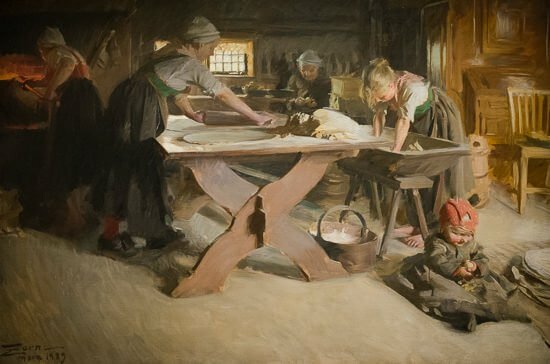 When we then see a painted version, Zorn has used a strong red alongside the white contrast to place the initial focus on the top left of the painting. 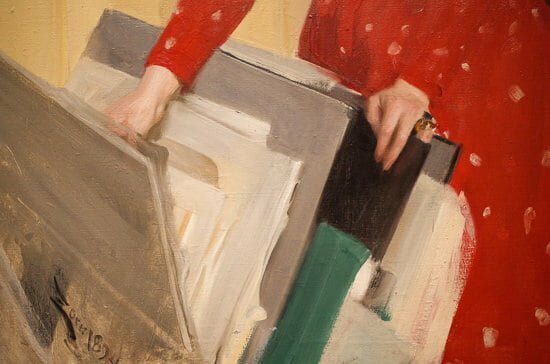 As we’re often drawn to the strongest areas of contrast and highly saturated warm colours, Zorn’s made sure it’s impossible not to look at the red dress first. It was amazing in this oil sketch how strong the colours were painted on the face yet the face still appears naturalistic and bathed in warm light through the window. Zorn loved strong contrast and dark patterns. 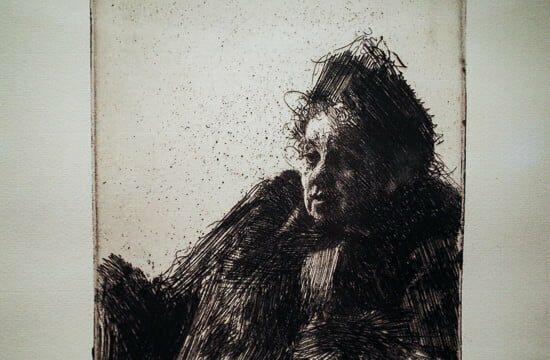 In this etching of Madame Simon, 90% of the face is in shadow, it has a real feeling of contemplation and reflection. I love how he’s distinguished the background simply by using dots instead of lines and also changed the directions in his marks to reflect the different changes in surfaces. You can see the influence from Rembrandt when compared to one of his etchings. 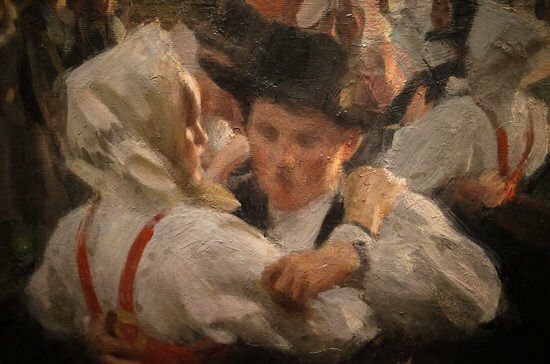 Despite the high society and recognition, Zorn never forgot his origins and painted with equal enthusiasm his traditional daily life in Sweden. In 1896 Anders and Emma left Paris to settle back in Mora located in the Dalecarlia province on the banks of Lake Siljan. Zorn fully embraced this simple life close to nature in Mora and in Gopsmor, a wooden home more isolated than his townhouse in Mora, which would later become the Zorn museum. From now on most of his paintings are drawn from daily life, the cowherd in the forest or local women attending their tasks. 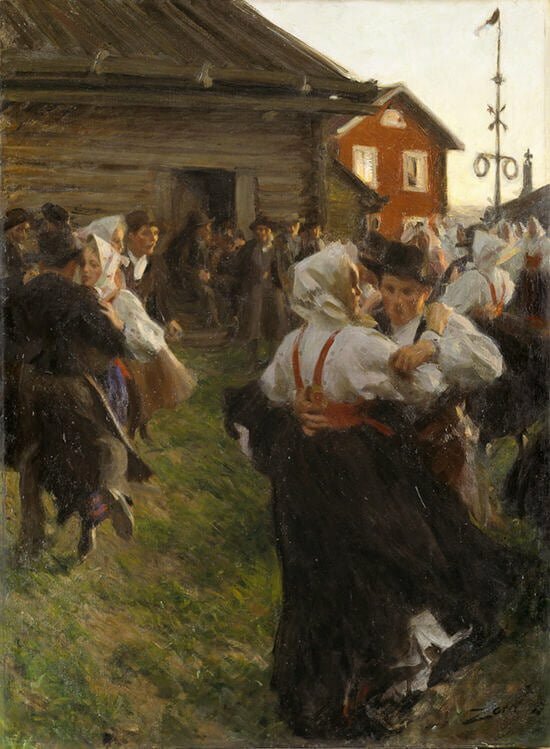 But the painting he was perhaps most proud of ‘Midsummer Dance 1897’, is not only a reflection of his love for Dalecarlia but also it’s bright summer nights and it became a classic in Swedish art. 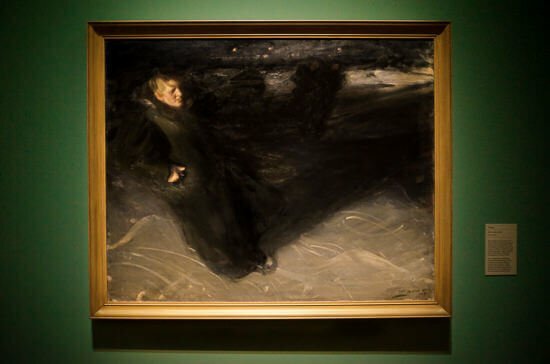 In some of the earlier pieces we looked at, Zorn used a strong green and vivid red to control our gaze, but in a painting towards the end of the exhibition, we can see a more subtle handling of this complementary colour scheme used to great effect. Just trying to search for the elements of cool green or warm red, you notice a lovely balance throughout this painting. 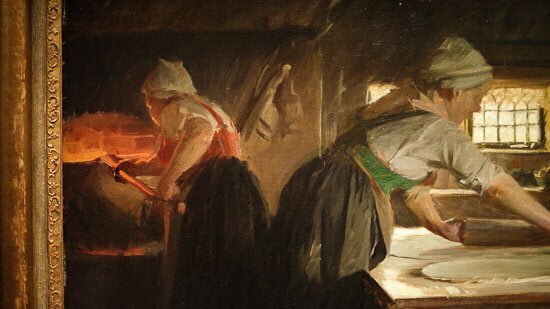 From painting high society and elaborate decor to paring it right down to painting the every day, Zorn takes the most mundane scenes of baking bread and washing and elevates them to a rich fascinating scene. The painting works so well from a distance because you get a real sense of movement and atmosphere, then you get a little bit nearer and observe the deft brushstrokes, then really close up and the subtleties are truly beautiful. The close-up details would work brilliantly as a piece in their own right. In the late 1880’s Zorn began a series of paintings studying the female form, often women bathing, it was an opportunity to observe the effects of natural light on the human body. 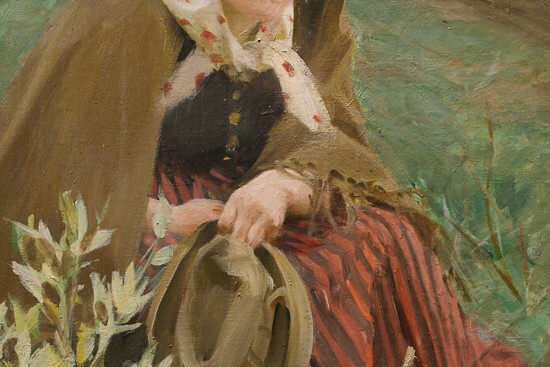 If you’ve been studying portraiture you may have heard people talking about the Zorn Palette. 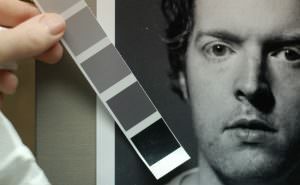 He is known to have used a white (probably Lead White) Yellow Ochre, Vermillion and Ivory Black. 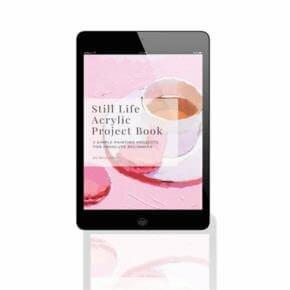 A common modern version of the palette uses Titanium White, Yellow Ochre, Cadmium Red and Ivory Black. In the self-portrait detail above, he prominently displays his limited palette of colours within the composition. It is surprising the range of colours that can be achieved with this palette, it’s an efficient and effective way to learn how to mix flesh colours for portraits. It limits your choices and prevents your colours from going too saturated, too soon. You will have noticed alongside the subtle earth colours there are stronger greens and various other pigments in some of the paintings. The green was most likely Chromium Oxide Green as quite a few tubes were found in Zorn’s studio following his death. It’s always interesting how your eyes become tuned in after being immersed in a painters style, there was a little Zorn moment later in the day passing this bistro, check out that muted green just wanting to be mixed with some Yellow Ochre and Ivory Black! 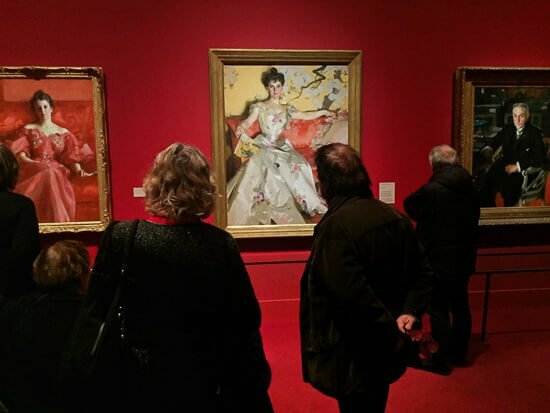 The exhibition was really fantastic and as the paintings had been displayed chronologically, it gave a real glimpse into his journey as an artist throughout the different environments and chapters of his life. If you’d like to learn more about the Zorn palette you should have a look at the How to Paint Natural Skin Tones with Acrylics Course. In the video course, I introduce the Zorn palette and we produce 2 studies based on Zorn’s works. New! 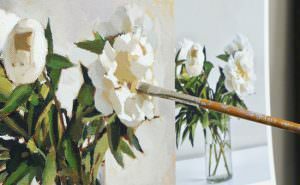 Floral Still Life Acrylic Painting Course is now Available! Cheers Ali, so pleased you enjoyed it, have a great Christmas, hope the Shrewsbury show went well! What a fabulous, informative, read. I am fascinated by Zorn. My husband and I greatly enjoy Sargeant. It is always so interesting to learn about a new artist to study. Thank you, Will Kemp, for sharing your trip with us. My pleasure Jennifer, so pleased you enjoyed learning about Zorn. Thank you. Came back to the hotel from a disappointing visit to the Uffizi (Florence) and found this. Thank you. Lively and interesting. Glad you enjoyed the article Jennifer, hope the Gelato’s good! My favourite Midsummer Dance , Summertime Fun and The cigarette girl. What a wonderful Christmas gift from you to us, your students and admirers. Thanks for your generosity, keen eye, and above all, your excellence as a teacher. Still using your Venice Light lessons. Hope to move onto another unit next year. That’s very kind of you to say so Beverly, pleased the Venice course is going well. 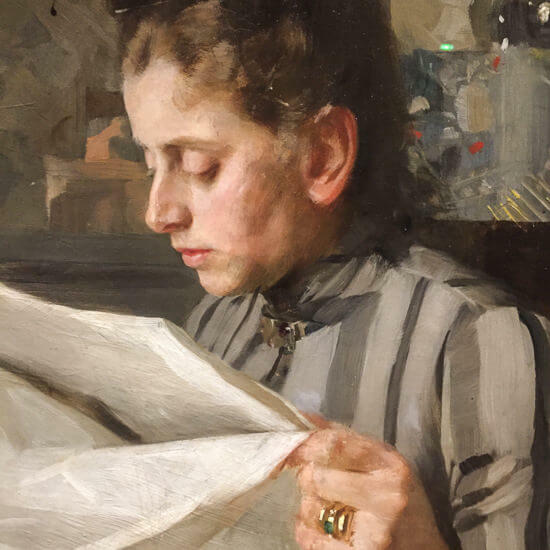 Thank you for your excellent article on Anders Zorn. I’ve been a longtime fan of his and I loved seeing his show through your eyes. Well done. Really glad you enjoyed it Cathy. 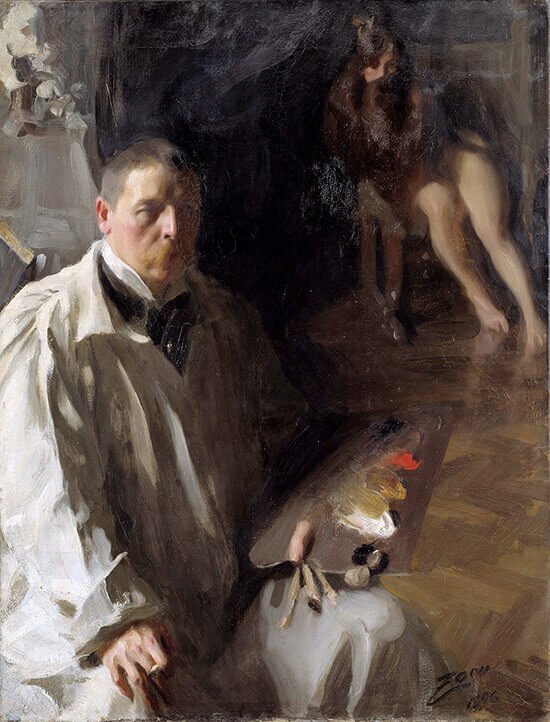 Honestly, I was not familiar with masterworks of Anders Zorn. His paintings are amazing. Very nice Northern gamma of colours. Especially catches fancy his watercolor «Summertime Fun». How he managed to paint such a realistic water? It’s inconceivable! Pleased you enjoyed discovering his works Anatoly yes, it’s a fab painting, isn’t it. Thanks, Will for a fascinating glimpse into this master’s work, and I very much appreciated your own insights, too. Very appreciative. 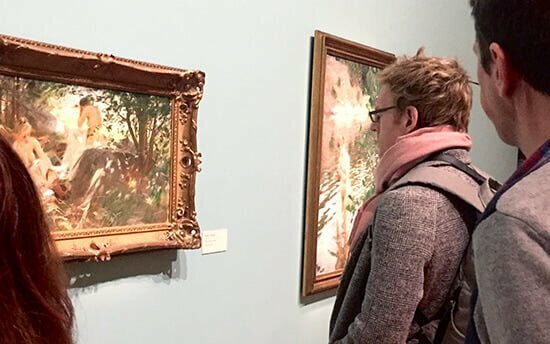 Thank you so much for sharing the Zorn exhibit, and especially the close-ups of his paintings. I will check out your acrylics course using Zorn’s palette right after the holidays. This was such a treat! Glad you enjoyed the close-ups Susan, thanks for the festive wishes. 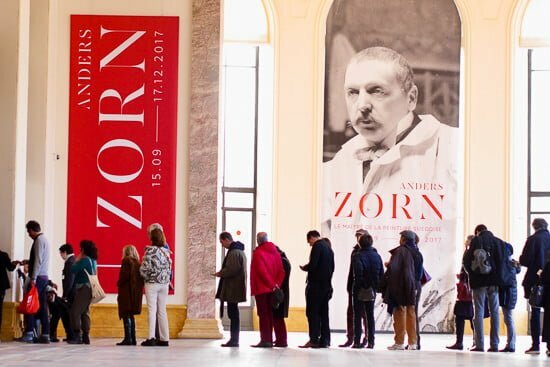 As soon as I saw the poster advertising the exhibition, I thought that Zorn looked remarkably like the character you used in a portrait lesson. Oh Will, how remiss of me. I forgot to wish you and your family a very Merry Xmas. Ha, ha, much appreciated Matt and a happy Christmas to you too! Will you have done it again superb paintings and advice. Thanks very much Steve, hope you have a lovely time with the family. The other picture that lingers in my memory from the Palais is the enormous one of the little travelling circus (painter unknown alas). Scores of gems there and few people seem aware of its existence. So pleased you caught the show Leonard, yes that painting is epic, isn’t it! a really lovely museum. Thank you very much for sharing. I took your one course on black and white portraits in oil and was looking forward to one in color that I believe you offer in oils. Thanks Steve, pleased you enjoyed the black and white course, yes there is a colour glazing portrait course that builds on the grisaille techniques. Thanks for sharing Will! Anders Zorn is a great painter. I love all of his paintings. Thanks again for sharing! My pleasure Willie, glad you enjoyed it. 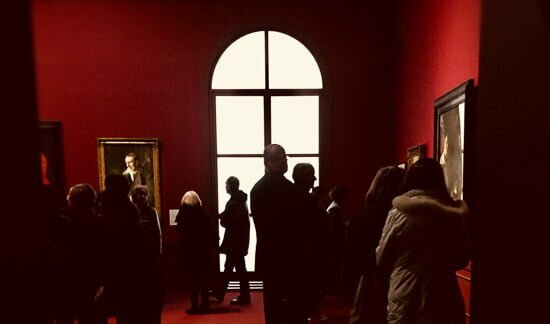 I want to thank you so much for sharing your wonderful photos of the Zorn exhibit. It is so kind & generous of you! I am enjoying it immensely! My pleasure Pat, pleased you enjoyed the photos. Yet another absolutely great resume on the artist Zorn. Many thanks. There is only one problem with your indepth view of art and the artist – it leaves me breathless and makes me realise just how much there is to know! There are so many aspects to art and I wonder will I ever be able to absorb all this knowledge? 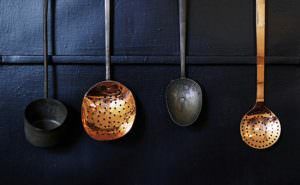 I do think my appreciation is so much greater now and I certainly do notice things I would never have ‘seen’ before with an artist’s eye – but I still feel a bit of a beginner when I read articles like this…. But please keep them coming. Ha, ha, yes there is lots going on in Zorn’s paintings, but you’ll start to see patterns and techniques emerging and reappearing through other painters works, pleased you’ve been noticing things you wouldn’t have seen before, Have a great Christmas Myra. I thought I had heard of most of the really ‘big names’ but I’d never seen any of these works by Zorn! 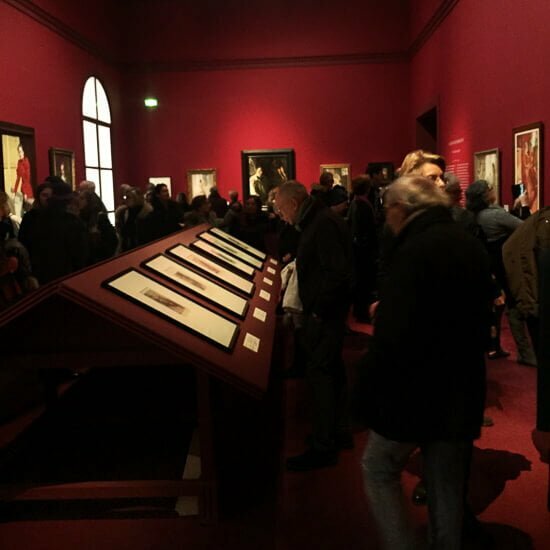 Thanks for sharing this exhibition! What a virtuoso he was. Best wishes for Christmas and thanks for all the inspiring posts! Pleased you enjoyed learning about Zorn’s paintings Katherine and thanks for the Christmas wishes. Thank you Will. I hope you have a merry holiday, and a new year filled with all that you Wish for. Sincerely, Shirley. Thanks Shirley! have a lovely Christmas. I was in Paris a week ago – missed that exhibition! Bummer City! Have a nice holiday season. What a shame Bill, hope the photos gave you an insight into the exhibition, have a great time with your family. You do know I hate you. You live in London and you just pop over to Paris like we here in Houston drive up to Dallas. It’s just not the same. You’ve taught me a lot about how to look at things and draw and paint them. Wish I’d started a long time ago. I know Mike, it’s a very fortunate position to be able to visit the shows, glad you’ve been enjoying seeing things with your new artist eyes! Thanks for this article, Will ~ I really enjoyed it! Yes, I too am envious that you got to see so much of Zorn’s work in person. Learning about his palette for skin tones was a big eye-opener, for me, a couple of years ago when I did your portraiture course in Acrylics and I have used it a lot, ever since, in my own work! Merry Christmas and Happy New Year ~ Keep doing what you do, so well, ’cause it’s really appreciated by people such as me!! Glad the palette’s been helpful in your portraits Hilda, hope you have a brilliant Christmas. Thank you for this inspiring article Will. So much appreciated!! My pleasure Johanna, so glad you enjoyed it. Thanks for sharing your trip and insights! Merry Christmas to you and your family! Thank you so much for sharing this “Zorn” experience with us. 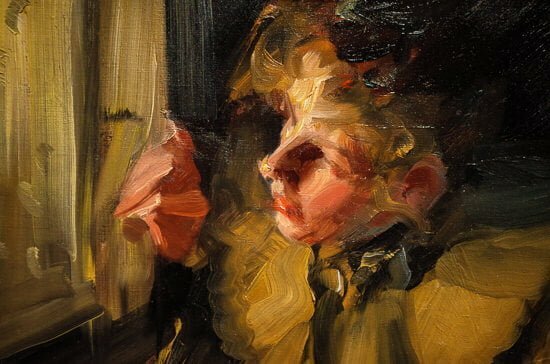 I’ve always been fascinated by the Zorn palette. I wish Zorn got the recognition he deserves…what a talent. My pleasure Mike, pleased you enjoyed it. Thanks so much for sharing your insights and pictures! I really appreciate it. What a delight to open my computer this morning here in Albuquerque, New Mexico, and be transported to such a fabulous exhibit in Paris! Having you point out all the wonderful details was as if we were walking right next to you! Un très grand merci!!!! Many thanks Will for yet another detailed and interesting article. It’s so good to be introduced to different artists and their work. All the best to you and Vanessa for Christmas and the New Year. Thanks very much Peter, pleased you enjoyed learning about Zorn’s work, thanks for the Christmas wishes, have a lovely time. Wonderful Article as always! Thank you so much for sharing your travels and experience with us. I’m always so very grateful for these times. Happy Holidays !! Cheers Maria, hope you have a great Christmas. Thanks Beth, it’s a really lovely painting Baking the Bread, so pleased you enjoyed the article. Glad you enjoyed learning about Zorn’s work Cheryl, hope you have a lovely time at Christmas. Oh thanks for making my day Will, I always get excited ro see an email from you and once again I’ve learnt so much. Love Paris, my husband and I were there for our silver wedding anniversary in May, there’s something magical about the rooftops, love your sketch. Merry Christmas to you and Vanessa and a Happy, Healthy and Prosperous New Year, you so deserve it. My pleasure Sheila, how lovely to have a silver wedding anniversary in Paris, same to you, have a great time with your family. Will, you are a born teacher and we all are the recipients of your gift! Merry Christmas from Houston! Thanks Beth, you’re too kind, have a great Christmas. What a great exhibition! Thank you for sharing all aspects of Zorn work and his influences, a real retrospect. SO inspirational wants me to take more classes! Pleased you’re feeling inspired Joe. Thank you Will for sharing your experience and for pointing out lots of interesting tidbits on Zorn’s approach and style to his art. Inspiring and very informative. Makes me want to paint. So glad you enjoyed learning about Zorn Louise. It’s great isn’t it Maria, glad you enjoyed the min-trip through the show. Thanks for the recommendations Kim, very much appreciated. Have a great Christmas with the family. Obviously a super exhibition. Thanks for sharing it. I hope you do not mind but I am going to share it with a friend of mind as I am sure we will have an enjoyable discussion about Zorn’s skills next time we meet. Compliments of the season. Bernie. Will, so happy you shared this experience with all of us here in Louisiana and beyond. 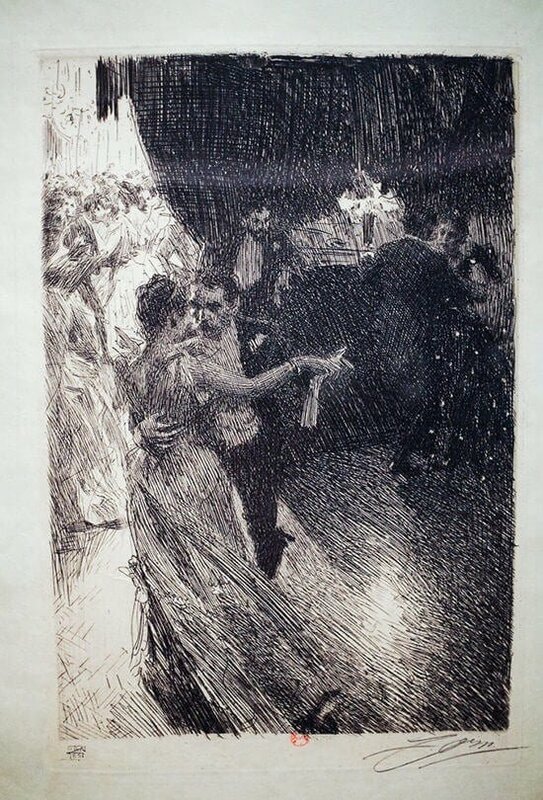 I was so privileged to view “The Waltz” original oil hanging in the Biltmore Estate located in Asheville, NC. Mr. Vanderbilt purchased the painting in 1893 at the Chicago Worlds Fair. Also featured in the house is work by Singer Sargent, Whistler and Renoir just to name a few. “The Waltz” is a stunning masterpiece and his perspective of his subjects is what you Brits call “Brilliant”! 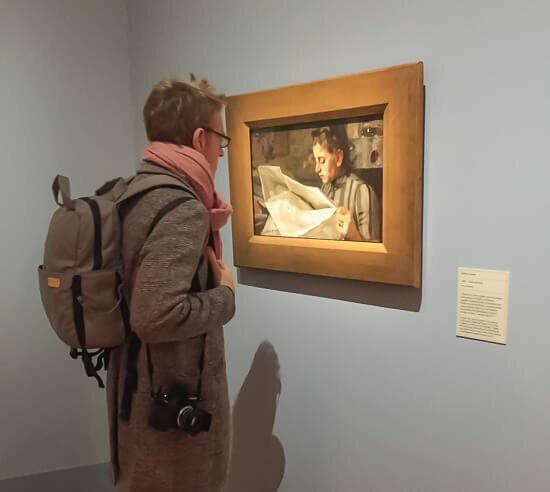 How interesting Sheryl, great to be able to see the painting amongst Zorn’s contemporaries, so pleased you enjoyed the photos. Festive greetings from ‘down under’. Your articles are interesting and inspirational and I learn a lot from your tutorials. Thank you so much , it is enjoyable . You so kind to remember us ! Thanks very much Vivian, same to you, have a wonderful time. Thank You For The Share, so exciting to have the opportunity to enjoy these great paintings in your lifetime. Congratulations. My pleasure Anndell, so pleased you enjoyed it. Thank you for the thorough and fantastic review of Zorn’s work. I consider this a special Christmas treat for I live a long way from such great galleries of paintings. I will be reading and viewing this blog again as there is so much to digest. Best wishes for the Christmas season and for the New Year. Have a great Christmas and Happy New Year.. Thanks Jason, so pleased you enjoyed learning about Zorn’s work. Cheers Tom-paul, very kind of you to say so, have a great Christmas! What a treat to find this in my inbox today. Thanks so much for sharing and teaching. Learned so much. I couldn’t resist – ordered myself the sketchbook that you used :) and am now on the lookout for a nice book on Zorn. I can’t even imagine how he accomplished that stunning watercolor. I don’t suppose he even had the advantage of a photograph. Could he have painted that from life? The red museum walls, floor and ceiling (?) struck me as very unusual. Did you find that complementary to the paintings? Looking at the photos, I wondered if the intense colored walls would have been distracting or overpowering in the space. Thanks so much for the inspiration. Merry Christmas and Happy New Year to your family, Will. 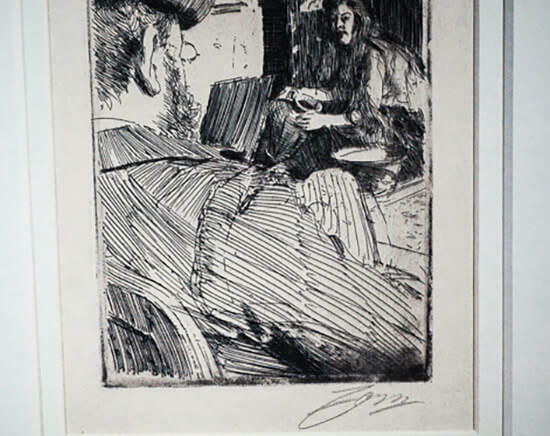 Pleased you enjoyed it Linda, yes, Zorn is known to have used photographic references for some of his works. The walls would have been a little more subdued than some of the photos and for the Parisian time of Zorn’s life seemed to give that warmth of the Moulin Rouge! Thanks Will for sharing your experience. I enjoyed reading this post immensely. Merry Christmas to you! Really pleased to hear it Peter, same to you. Hey thank you so much for sharing your gallery visit. It’s fascinating and also reminding me of some tips you have shown us in the acrylic portrait course back to mind. Take care, have a great Christmas and see you in 2018! Thanks Aya, have a lovely time aswell. Merry Christmas, Will and family!! Zorn’s Summer Fun nearly took my breath away, especially when I read he had painted it in watercolours. I also especially enjoyed Baking Bread, as I bake our bread, but I do confess that I use bread machines. The work those women did, I do not think that I could keep up. 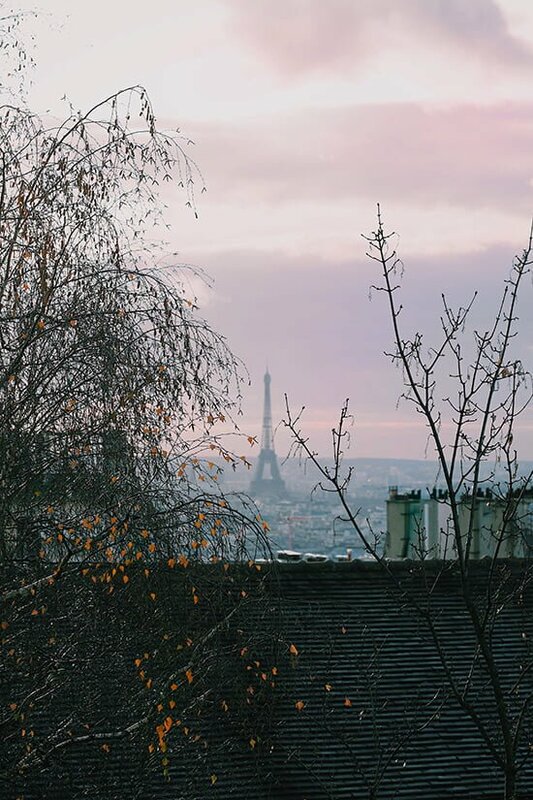 I am so glad that the trip to Paris was so beautiful. And, I loved your inspired pen and ink at the beginning! 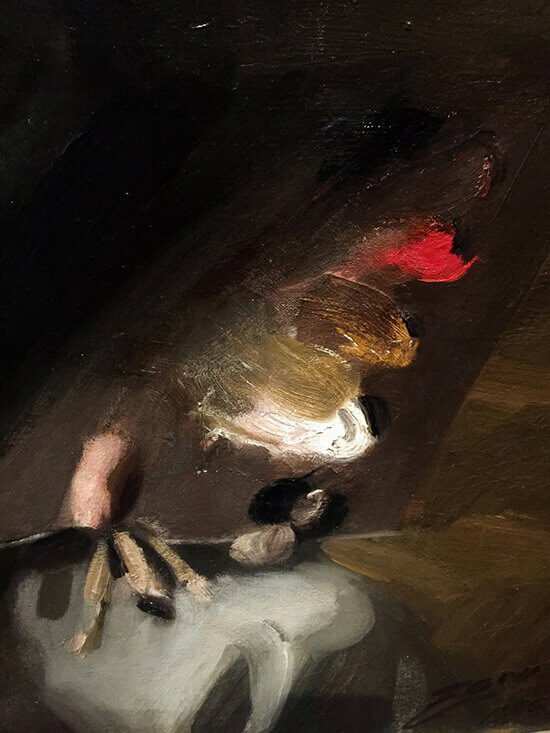 A nice and informative review of Zorn’s paintings. Have a great Christmas and I am looking forward to see more of your articles in 2018. Cheers Norbert, and to you, hope you have a great time and here’s to a creative new year. 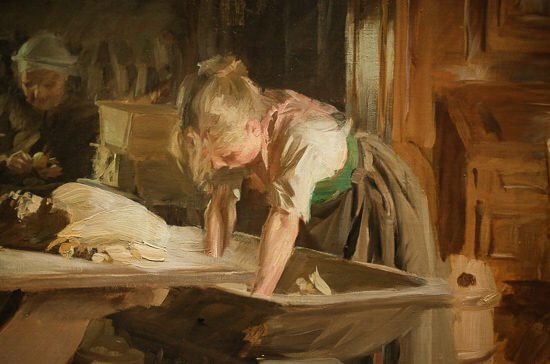 Zorn’s work is breathtaking. Thank you so much for sharing his painting visually and adding your learned commentary. Such beauty and knowledge should be shared. Cheers Noralee, really glad you enjoyed learning about Zorn’s work. Will wonderful xmas present. I am sendig it on to my mallorcean artista Friends. Thank you so much. Feliz navidad. Thanks very much Joanna, much appreciated, have a lovely Christmas. Will, it was a big pleasure to read your article and see photos of work of such a great artist Zorn. I have never heard about him before by some reason and was very happy to learn. He is amazing. I absolutely love his paintings both oil and watercolor. He reminds me of Russian artist of approximately the same time Valentin Serov. 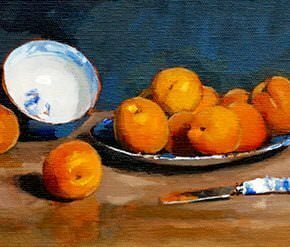 I am not sure he is as well known in the West as John Sargent but he is a great artist and very much loved and known in Russia. So thank you so much for this post. 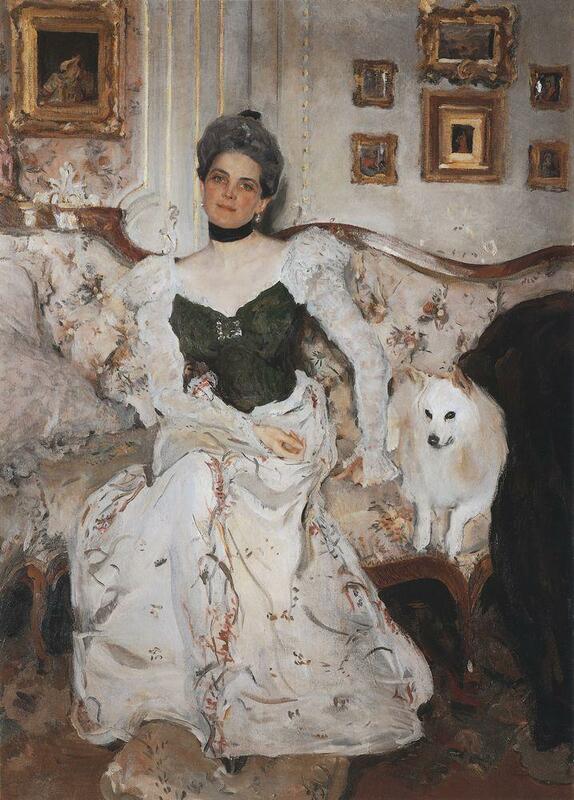 Thanks for the link Irina, a beautiful painting by Serov, so pleased you enjoyed discovering Zorn’s paintings. WOW! Simply fascinating. Thanks so much for sending out. His use of light and dark take my breath away!! Glad you enjoyed it Judy. 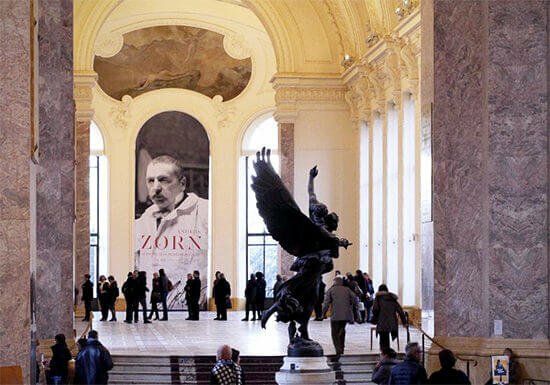 Hi Will, thanks for a wonderful virtual trip to Paris and and giving me the opportunity to look and learn more about Zorn”s work and amazing use of color and brushwork. . Once a teacher always a teacher!!!!!
. I enjoyed all your comments and highlights and even “shared” a cup of coffee with it. You’re very welcome Zully, hope you have a wonderful Christmas. Thanks for sharing so many helpful tips and insights. I appreciated the chance to “discover” this artist. Thank you so much for this lovely article. 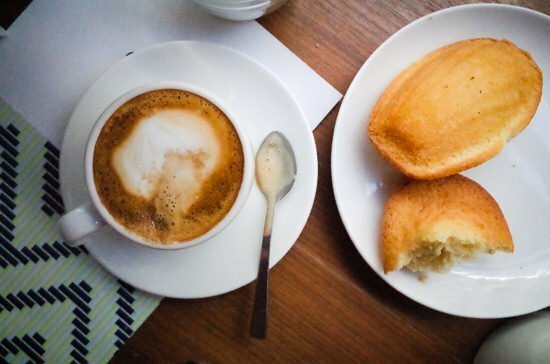 It was waiting for me in my inbox when I awoke yesterday and I reveled in an imaginary sojourn back to Paris to do my absolute favorite things: enjoy a noisette and a croissant at a busy street corner cafe, stroll the boulevards and riverbanks, gaze over rooftops and most importantly, feast my eyes on incredible works of art. There’s nothing like the feeling of drinking in the brushstrokes with your bare eyes and feeling that the artist is reaching through history to share a moment in time with you. I enjoyed all this (through your article) before even getting out of bed yesterday. Thanks for that! So pleased you enjoyed it Veronica! So pleased you enjoyed it Karen, and glad it gave a new perspective on your studio works. Have a lovely time over Christmas and enjoy your local Pinot Noir! Thank you for sharing this exhibition with all of us. As I live in South Africa the chances are small that I will be able to personally go and see these works of art. So this article is very special. My pleasure Marianne, glad you enjoyed it. 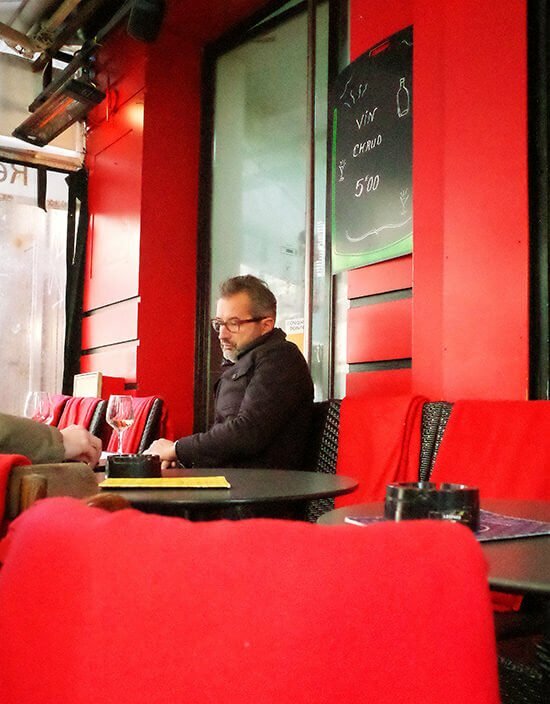 Will – thanks for the detail!–I believe I’ve just been to Paris! Seems like a favorite trip of yours and so looking forward to putting the energy to work! Ha, ha, cheers Michael, so pleased you enjoyed it. Will, for some reason I just today found this email in my junk file. I am so glad I checked. I am absolutely floored by summertime fun. The attention to detail in the boat and dock, not to mention the subtle transparency of the water to show the sea floor at the lower portion of the watercolor, is amazing. The depiction of the chop on the water alone is mind boggling. I kept looking for flaws, and found none. The rest of the exhibition was equally as wonderful. Thank you for bringing this to all of us. A Merry Christmas to you and yours. Really pleased you tracked it down Alfred, and glad you’ve been enjoying studying the paintings, have a lovely Christmas with your family. Thank you , Will , for sharing those great images with us . I’ve been to Sweden and have seen some of this artist’s work — really exciting and so painterly . May I take this opportunity to wish you and your family a very happy Christmas and a great 2018 . Thanks for your kind wishes Patrick, glad you enjoyed seeing more of Zorn’s work. Have a great time over Christmas. Absolutely brilliant. Thank you so much. As I’m in Australia not much chance of popping across to see the show so your account with its mixture of the personal and professional is truly appreciated. The next best thing to being there. Thanks for your knowledge and taking the time to share. That’s very kind of you to say so Philippa, really glad you enjoyed the exhibition review. Thanks Christine, hope you have a lovely time over Christmas. What a great exhibition! Loved reading your article. Thanks for sharing I learned so much about this amazing artist. 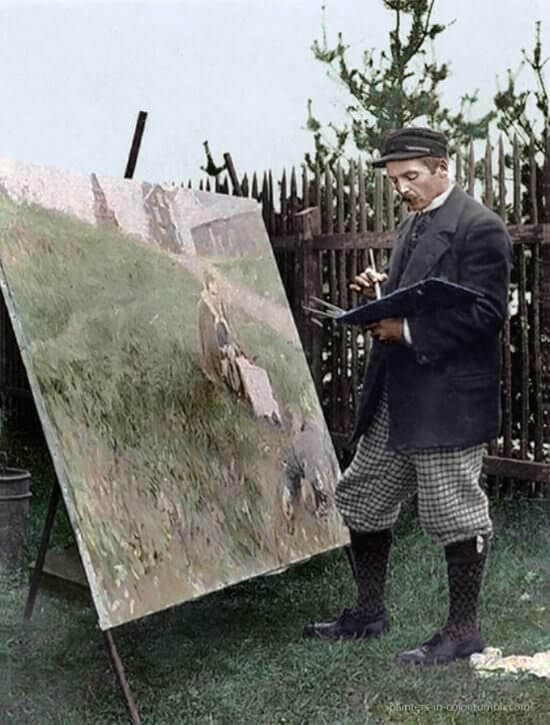 Funny though I’ve read about the Zorn’s palette in one of my art books however there was no mention about his art works. Really pleased that you enjoyed learning more about Zorn’s work Ramonita. Thankyou Will for the very interesting article on the Artist. I really enjoyed reading of his life etc. I also enjoyed his paintings. beautiful pieces of work thanx for you have visited there and collect it for us nice work . Thank you so much for sharing this amazing artist with us….if only I had a tiny bit of his talent and yours too !!!!! My pleasure Penny, hope you have a lovely Christmas. 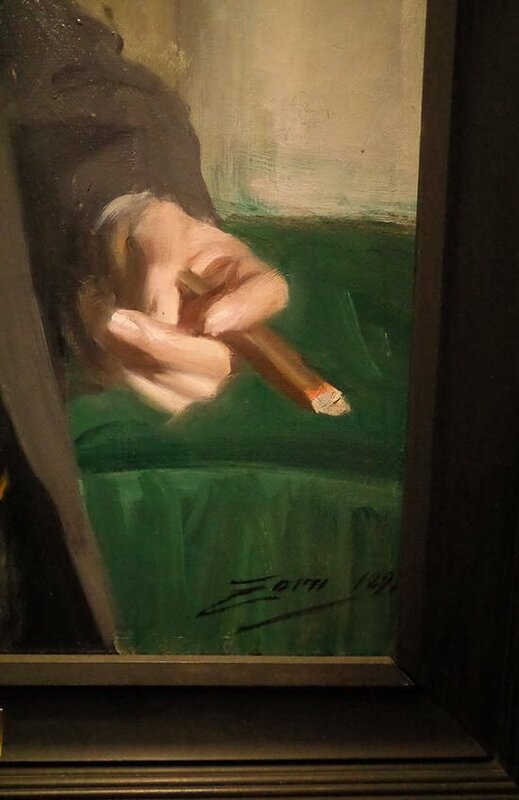 Zorn was not a painter I was familiar with. His ability to paint light on skin tones is absolutely remarkable, to the point where you can almost feel the temperature of the air, just by looking at the painting. I’ll have to look into his work in more depth. Good one Jamie, so pleased you enjoyed it. Have a great Christmas! Good one Cheryl, glad you enjoyed it, happy new year to you! So pleased you enjoyed it Nicolle. What a great journey you took us on! If I could teleport back into time, I’d love to ask Zorn why it appears to me that so many of his etchings were intentionally turned into mirror image oil paintings? I can’t imagine it was purely “transfer technique”? I’m totally facinated by this, what are your thoughts? Now that the holidays are over, I’m finally going to have a full day at the MET here in NYC to see “Leonardo to Matisse”, “MichelAngelo”, “Edvard Munch”, “David Hockney”, “Rodin” exhibitions and I am really excited about the upcoming “Thomas Cole” and “Public Parks, Private Gardens” exhibitions! Enjoy your time at the MET Ricky, yes it is interesting with the mirror image, this can often happen if working from an etching where the print is a reverse of the drawn image. Thanks for the ‘Zorn Tour’. I found it an extremely interesting and educative read. What beautiful art works you have shown me. Your “Zorn Tour” was actually a very well guided tour. It feels like I have been walking through it personally with an excellent artist as my tour guide’! Learnt so much from your beautifully written article and the illustrations! Thank you, Will! So pleased you enjoyed it Helen. thank you for sharing such beautiful paintings here and salute you for sparing your precious time for visiting to this art gallery. That’s very kind of you Subhash. Really pleased you enjoyed it Eduardo! Wonderful post, and what an exciting, in-depth education one would receive there. I have worked a little with the Zorn Palette – it’s deceptively tricky but I recognize its enormous potential. And then to see how it’s manipulated in the hands of a master… well! Thank you for the morning inspiration, Will! My pleasure Gary, really glad you enjoyed reading about it. Enjoyable article to read. The painting Summertime Fun is unbelievable, especially the realism of the wave and the transparency of the water. Also I love that you started the day with a sketch. 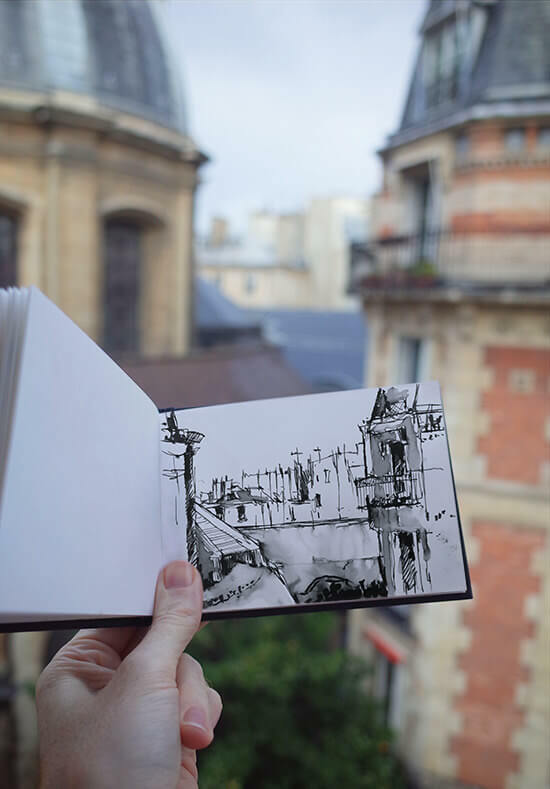 That view from your hotel is so great, do you happen to know the building that you sketched? It would be an awesome place to do some acrylic painting too. I’m afraid I don’t know the name of the building that was sketched Ge, pleased you enjoyed the article. Awesome article. Great to look at but I also learn so much from your observations about the paintings. Thanks much for putting it together. Cheers. How I am going to thank you that you shared it and made my day. Though I have opened and seen it much late but still I enjoyed like anything. Thanks for you gesture. Through your eyes I could see a great artist’s live exhibition. Great. More over your expert eye showed us pointed us the important areas to be noticed. My pleasure Salma, so pleased you enjoyed the tour through the exhibition. I’m wondering if you have more photographs, particularly containing the information placard, of the painted version of Zorn’s “Valsen” or “Waltz”. I’ve just come home from a trip to the Biltmore Estate where the (an?) original hangs. We purchased a print and both our print and the etching you display have some significant differences from the painting you display. Both the etching and the Biltmore painting show the bystander to the right of the male waltzer, while the painting you display has the man directly behind him. 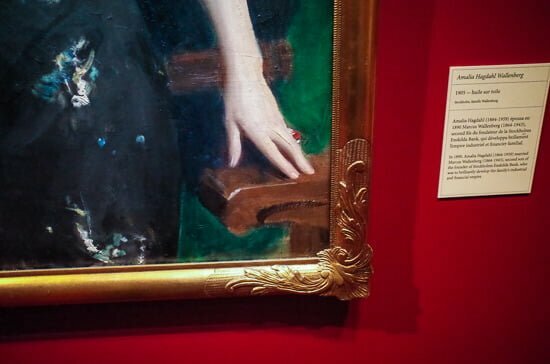 In addition (and more striking), there is no “red dress” in the Biltmore painting and the female waltzer is in white, not black as in the painting you display. Images of the work at https://www.anderszorn.org/ also show a white dress and no red dress. I’m very interested in these differences. Can you shed any light on the situation? Are there multiple copies of “Valsen” from different times in Zorn’s career? 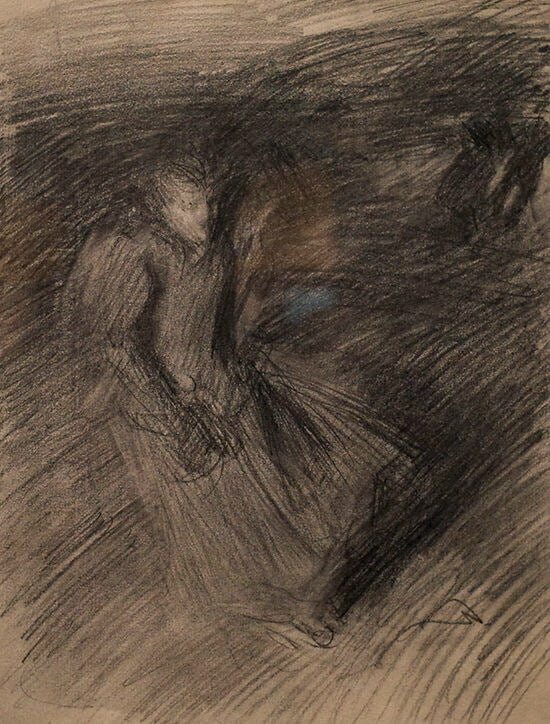 Was the “red dress” painting done by another based on his etching? It’s a mystery I’d love to figure out! 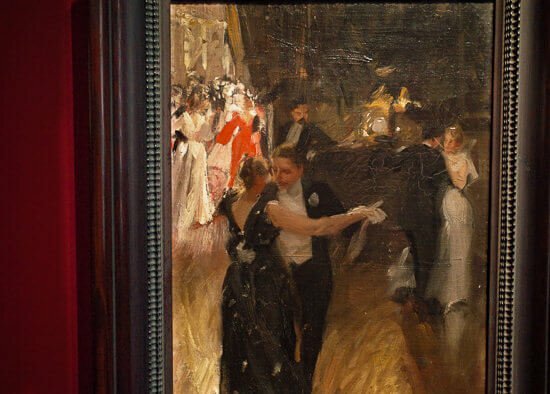 Hi John, I’m afraid I didn’t take any more photos of the information for the waltz painting, but you’re right, there does seem to have been multiple versions of the painting, all called the waltz, but some as you say having a white dress and others a red dress. I’m not quite sure of the timeline of the different paintings, if you track any more info down let me know. Brilliant analysis and writing! I learn so much from your observations and writing style. Thanks for sharing! My pleasure Lynne, hope it gave you a small insight into the show. Returned to your Zorn article just to have a feel good moment. I wasn’t able to view the exhibit so your blog is a vicarious replacement. (My knees would have buckled had I been there. WOW!) So wonderful that you managed to take the up-close pictures. I appreciate your commentary and have learned so much more about art through your website. Thank you!. That’s brilliant to hear Wren, really pleased you enjoyed the images from the show. Thanks Will, for a fantastic article/tutorial on Zorns art and his life, so well researched too a real pleasure to read it. An amazing artist he certainly was. He really understood how to combine muted earth tones with little pockets of strong saturated intense colours in his paintings. Also how to read the human psyche and what it is drawn to. Simply brilliant. My pleasure Andrew, yes he had a real mastery of combining the earth tones together whilst still keeping a freshness. Glad you enjoyed it Scott, I’m not sure of the private collection the paintings is in, but hope the exhibition review gave a glimpse into the piece.